The key objective for the QA process is to ensure that the agreed standards have been met for every package before it gets passed to User Acceptance Testing (UAT). It saves a lot of time if problems are identified during the QA phase as they can be quickly remediated by the packaging team and re-run through QA. If however QA is skipped and the application goes straight to UAT, there is a chance that the UAT person will miss one of the QA checks (eg. auto-updates weren't disabled). The application will then get deployed out to live machines, auto-update will run and errors may start to appear as the users don't have local admin rights. This will cause support issues, and the application will need reworking and updating on all the machines. That's a lot of unnecessary effort. 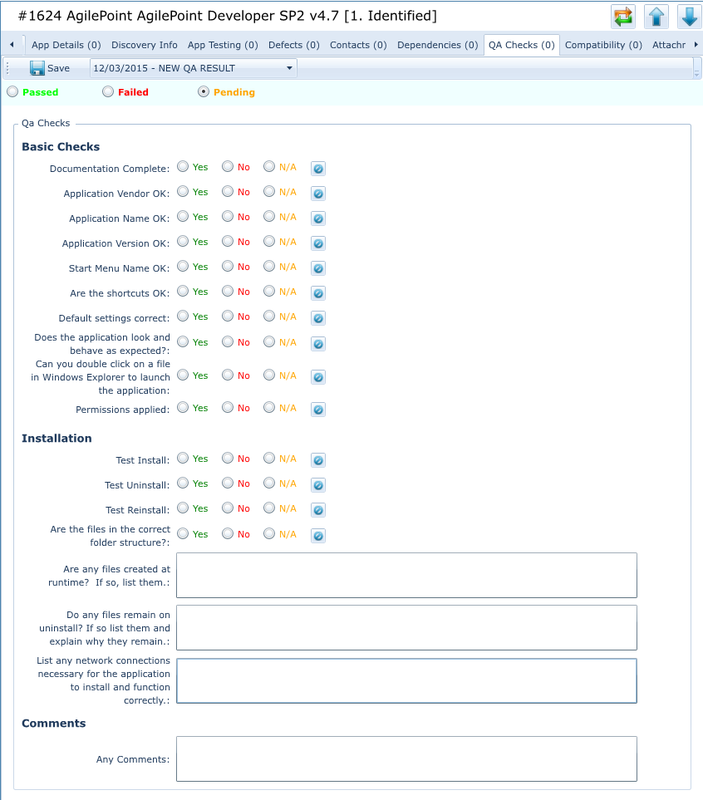 If you are using AppTracker we provide a fully-customisable QA form which can be used by whoever is handling QA in the organisation. When an application enters the QA process it's simply a matter of the QA person checking each item on the form and filling in the results. They can then give an overall result (Pass/Fail) and move the application to UAT (or return it to packaging). As always the relevant teams will be instantly notified of the change. You can view the QA results in the QA tab or the main Applications grid, and you can monitor how successful your QA has been historically in the dashboard. Managing the QA process using AppTracker allows you to make a significant time saving of approximately one-third for the reasons outlined above.